The latest addition to Samsung's tablet portfolio is powered by a dual-core 1GHz processor and has a 7-inch screen with a 1024-by-600 pixel resolution. With a lower price, Samsung hopes to attract a larger audience to its tablets. Sales of Android-based tablets more than tripled during the fourth quarter of 2011, but Apple still dominates the market, according to a recent report from Strategy Analytics. 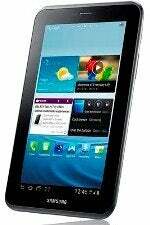 The Android camp had a 39.1 percent share of global tablet shipments, compared to 29 percent a year earlier. Apple's share dropped from 68.2 percent to 57.6 percent, according to Strategy Analytics.